Fans of bass music are probably familiar with the work of Ukrainians Sunchase & NickBee. After receiving recognition from listeners, labels and colleagues all over the world the duo decided to create their own label, the mysteriously titled 22:22. 22:22 is not just a label, it’s a large community of like-minded people designed to release music, organize parties, and develop and support talented musicians. The owner of 22:22, Sunchase, has been engaged in music for over 14 years, releasing his music on legendary labels such as Moving Shadow, Hospital Records and many others. In 2010 he released his debut LP, Static Nitro, and is now working on a follow-up album. Despite his young age, Sunchase’s partner in 22:22, NickBee, has quickly reached a level of professionalism that has resulted in a number of very successful collaborations between the duo and some equally successful solo achievements. Since working together Nickbee & Sunchase’s tracks have been picked up by several key labels including Noisia’s imprint, Invisible. 22:22 is the first Ukrainian drum and bass label, releasing music on vinyl and in digital format. The label’s debut release is the single, Summo / Belltine, two slices of aggressive and futuristic soundscaping that are impossible to ignore. A deceptively orderly intro sequence gives way to powerful percussion, staccato rhythms and ominous sound design. Thundering drums, thick basslines and cold, otherworldly engineering conjure up images of uninhabited planets and their alien landscapes. 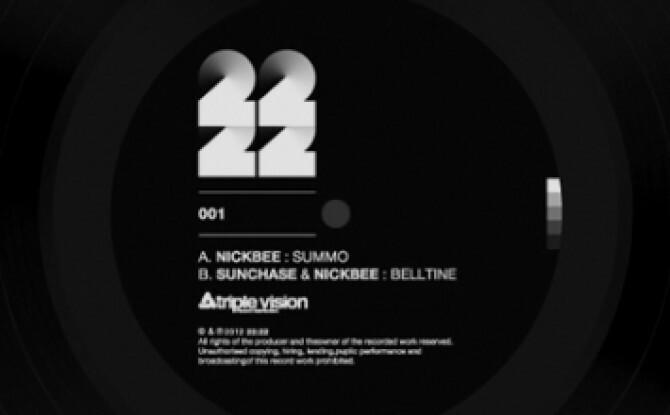 On the flip to Belltine is Summo, from Nickbee. Into his own version of chewing, growling neurofunk bass technology Nickbee skillfully interweaves echoes of the East, while the pounding drumtrack showcases a talent for audio well beyond his young age.